Spot Connect is a small button sized satellite terminal that connects to your iPhone or Android smart phone via bluetooth and allows you to send (not receive) small text messages and GPS positions via satellite when out of cellular range. Spot connect uses the Globalstar network of low earth orbit satellites. It can also be used to summon help in emergencies. SPOT LLC is a wholly owned subsidiary of Globalstar, Inc. (NASDAQ: GSAT). SPOT Connect provides connectivity to global communication satellites for sending location-based messages from around town or areas outside of cellular phone coverage. By simply downloading the SPOT Connect app, SPOT Connect wirelessly synchs via Bluetooth with smartphone operating systems like Android. SPOT message features are then initiated using the SPOT Connect app on the smart device. 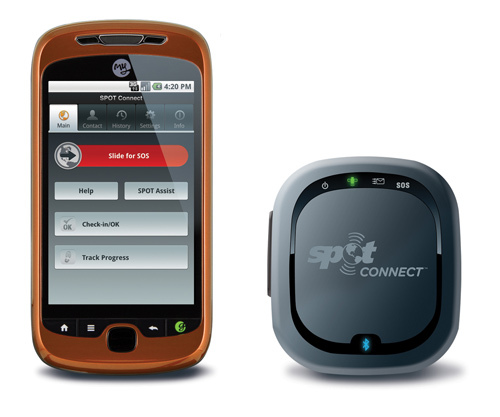 The SPOT Connect app can be downloaded anytime and works when SPOT Connect is registered with SPOT Basic Service and paired with the smart device. SPOT Connect is compatible with some of today’s leading smartphone operating systems such as Android . Additional smartphone compatibility is scheduled for release later this year. SPOT satellite coverage works around the world, including all of the continental United States, Canada, Mexico, Europe and Australia Northern and Central Africa, portions of South America and North-Eastern Asia and hundreds or thousands of miles offshore of these areas. According to a customer service representative, it works with newer iPhones and iTouch and might soon include the Blackberry. I called to ask if it would work with my bluetooth enabled netbook, but it sounds like this will not be an option and I will have to buy at least an iTouch. I was hoping to connect my netbook on my sailboat to the Spot Connect, use the built in GPS and be able to send short text messages from offshore from alsmost anywhere in the world. It should be very easy for a developer to make a laptop program to emulate the smartphone apps. To send custom messages on the fly, you would need to pay an additional $29.99 for 100 custom messages or $49.99 for 500 custom messages. One message sent to a group only counts as one message even though there might be several people in the group. Not bad really when you consider the coverage area, and being able to send from almost anywhere in any country and surrounding waters, without incuring cellphone roaming charges. $169.99 for the spot, $99.99 for the subscription and $49.99 for 500 custom messages. And then of course, you need to have a compatible phone or iTouch. 21415 visits to this page since 28 Nov 2012.